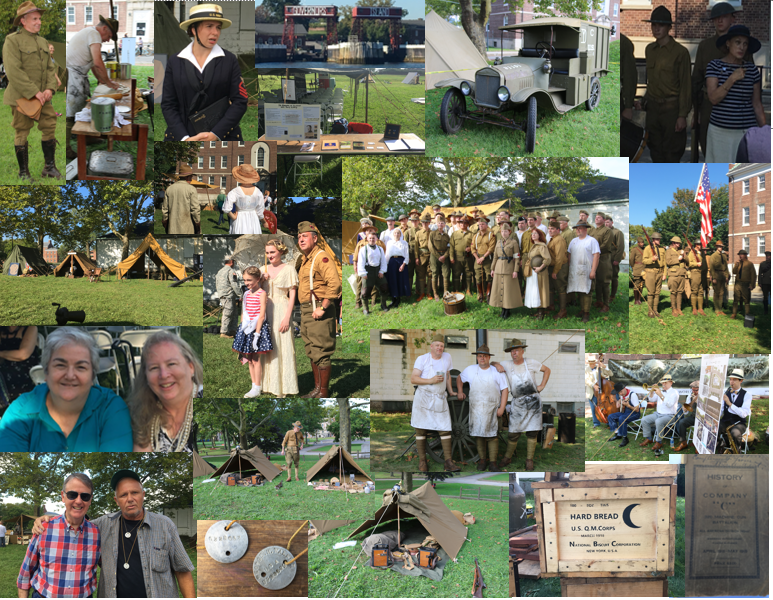 The 3rd annual Camp Doughboy WWI History Weekend at Governors Island National Monument was held on 15-16 September 2018. This was the biggest free public WWI exhibition in the U.S. this year, and was attended by 10.000 visitors. The weather was sunny and warm both days. My mission was to man a table where people could ask how they could learn about their WWI ancestors. On that table I displayed an informative poster, the WWI scrapbook of my Grandfather that I created (rather than inherited) and WWI Victory medals. I was also assigned to give lectures about how to find out about WWI ancestors. Corporal Kevin Fitzpatrick led us all through the events of the weekend. There were almost a hundred reeanactors present. Each and every reeanactor was impeccably outfitted, and had a story (or more) to tell about the Great War. Being able to see the authentic details of their wardrobe and equipment and to watch them perform their duties brought us back a century in time. Just to mention only a few of all those in attendance: the Harlem Hellfighters, a female contract surgeon, a WW1 Salvation Army Lassie, Imperial Germans and authentic Army cooks. Some visitors arrived in vintage clothing, and posed with the reenactors. The audiences at my lectures learned about a methodology for researching their own WWI ancestors, the records and archives available, as well as the story of where fallen soldiers might be buried. They were quick with great questions. Some visitors brought treasures with them. A gentleman brought his ancestor’s dogtags. His ancestor was from the South, but assigned to the Coastal Artillery in New Jersey. Another family brought the “History of Company C of the 320 Machine Gun Battalion.” Others brought pictures of their dashing soldiers in uniform. Many brought stories of ancestors who served in WWI for the U.S. and other counties. Two descendants of soldiers from the 51st Pioneer Infantry Regiment held a mini-reunion. Dr. Libby O’Connell of the WWI Centennial Committee for New York City addressed the gathering. She reminded us about the upcoming centennial and significance of the Meuse-Argonne Offensive. The period music was lively and added to the ambiance. The vintage trucks were a special highlight. When they were not driving, they were on static display. It seemed everyone who came took a picture of them. A major shout out goes to the authentic cooks of the Army Rolling Field Kitchen who created delicious authentic Army dishes using WWI Army recipes. The fresh doughnuts created by the WW1 Salvation Army Lassie in France were fabulous. Thanks to everyone who stopped by to ask questions, learn and chat. More blog posts providing follow-up information will follow. Camp Doughboy will return to Governors Island in 2019.